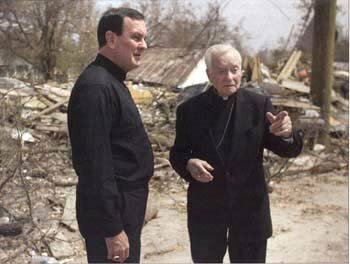 Earlier today, word from New Orleans indicated that one of the city's legendary figures -- the Big Easy's 11th archbishop, Philip Hannan -- had suddenly declined into "failing" health. Named a bishop by Venerable Pope Pius XII in 1956 and head of the NOLA church from 1965 to 1988, the 97 year-old prelate's life is the story of an American Catholic century. 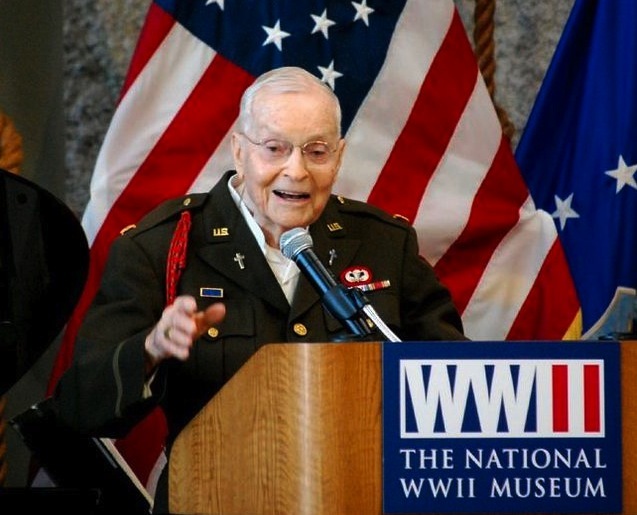 An Army chaplain in World War II (who could, as seen above, still fit into his uniform for a benefit a few years back), as a young auxiliary of Washington Hannan preached the funeral of the nation's first Catholic President; he attended the Council, launched an NFL franchise that, a half-century later, would win its first Super Bowl in his presence; became the first prelate ever to welcome a Pope to the American South, and from early on, undertook a side-ministry in radio and television, being stranded in his studio as the greatest natural disaster in the nation's history struck the Crescent City. And all that's just the top line. The whole of it is chronicled in his memoir, The Archbishop Wore Combat Boots: From Combat to Camelot to Katrina, just released this past June. Revered as the city's "first citizen" -- an honor he shares with the former Congresswoman and US ambassador to the Holy See Lindy Boggs -- such is Hannan's iconic status in the French Quarter and beyond that much of town reportedly veered into DEFCON5 on reports that a bronchial infection (since become pneumonia) had left him in a "dangerous moment." Hannan ordained Aymond to the priesthood in 1975; the city's 11th archbishop named his current successor as rector of NOLA's Notre Dame Seminary in 1986. All that said, New Orleans has a long history as a Catholic city. Between that and Hannan's place in local lore, it's not as surprising as it'd be elsewhere that, as the reports circulated of his illness, the local FOX station re-posted a Novena to the Holy Name of Jesus... recorded for it and led, in haler times, by the storied archbishop, himself.